Don’t know why I didn’t catch this earlier, but it strikes me as fairly important. Ipsos/McClatchy put out a health care poll two weeks ago. The topline results were nothing special: 34 percent favored “the health care reform proposals presently being discussed”, versus 46 percent opposed, and 20 percent undecided. The negative-12 net score is roughly in line with the average of other polls, although the Ipsos poll shows a higher number of undecideds than most others. Ipsos, however, did something that no other pollster has done. They asked the people who opposed the bill why they opposed it: because they are opposed to health care reform and thought the bill went too far? Or because they support health care reform but thought the bill didn’t go far enough? It turns out that a significant minority of about 25 percent of the people who opposed the plan — or about 12 of the overall sample — did so from the left; they thought the plan didn’t go far enough. 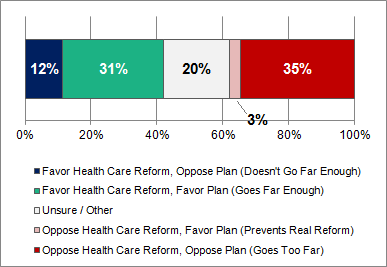 Ipsos also asked a parallel question of people who supported the plan: did any of them support the plan because they oppose health care reform and thought that the plan was sufficiently watered-down so as to “keep health care reform from happening”? A small number of people picked this response: about 10 percent of those in favor of the plan, or 3 percent of the entire sample. One way to look at this: 43 percent of people favor health care reform, whereas 38 percent oppose it (20 percent are undecided). But the actual plan under consideration gets numbers that are more or less the reverse of that — 34 percent in favor, 46 percent opposed — because a significant number of people think the plan doesn’t go far enough. Now, a lot of polls have shown that people favor the concept of health care reform, even if they don’t support the actual plan under consideration. So that finding, taken unto itself, is not that noteworthy. But the conventional wisdom — and certainly my assumption — has been that people oppose the plan because it’s too liberal. In fact, some of the opposition seems to stem from the fact that the plan is not liberal enough. This would help to explain, for example, why polls show majorities (sometimes fairly sizable ones) in favor of the public option, but also pluralities or majorities opposed to the overall plan. What’s less ambiguous, however, is that a significant fraction of the opposition to the health care bill comes from the left, and that opposition is almost certainly holding its polling numbers down overall. One interesting question, certainly, is what would happen to that 12 percent of the electorate that opposes the bill from the left if the Democrats in fact manage to get a bill passed (but one that “compromises” on the public option and other issues). What would liberal thought leaders — Howard Dean, Jay Rockefeller, Raul Grijalva, Jane Hamsher, Rachel Maddow, et. al. — say about the bill once it received the President’s signature? And would Obama tip his hat to the left, rather than the right, at the signing ceremony? My guess is that some of that 12 percent would peel off fairly easily — although, to be clear, my perspective on this is as someone who thinks the bill is pretty decent as is. With that said, I also think the White House’s positioning on this the public option has been questionable. There’s a middle ground between a world in which the White House would have insisted that the inclusion of a public option was a non-negotiable part of health care reform, and their actual positioning, which has been transparently indifferent toward it. In other words, run the bluff — and make the left happy — and then if you have to give up on the bluff at some point to get a bill passed, do some play-acting and look really unhappy about it. Give a big speech, say your hand was forced by the necessity to get such an important bill passed and your desire to reach common ground, blah, blah, blah. Some on the left, certainly, would look upon you cynically if you did this — but probably fewer than if you hadn’t seemed to care about the public option in the first place (i.e. what has happened in the the status quo). Meanwhile, you might have picked up a few points with independents for your apparent willingness to compromise.